Chief Bola Tinubu has said that President Muhammadu Buhari is focused on the development of the country and not just about himself. 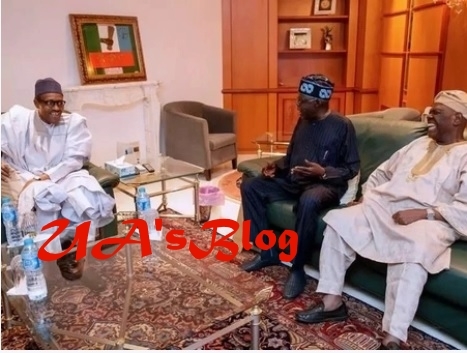 The All Progressives Congress (APC) chieftain spoke after his meeting with the president on Tuesday, February 13 which he attended with Chief Bisi Akande. Tinubu also responded to the call by former presidents, Olusegun Obasanjo and Ibrahim Badamasi Babangida’s call to the president not to seek re-election in 2019. The APC chieftain advised the duo to join the retirement club instead of trying to direct the affairs of the nation. On the position given to him by the president to reconcile aggrieved members of the party, Tinubu said: “Well, l feel greatly honoured with the mutual confidence that the president has reposed in me which is a very strong political challenge. We have started in earnest. He has given me free hand to put coercion, confidence and trust in the party. “Democracy is about conflict resolution process. You can’t do it without resolving conflicts. We can’t build it without understanding the conflicts and sources where we are coming from. But we want to leave the country with a legacy. It’s not about Mr President. That is what he’s telling the country. We had reported that as part of on-going efforts to improve cohesion within the ruling APC, President Buhari designated Tinubu to lead the consultation, reconciliation and confidence-building efforts in the party. Tinubu is expected to lead a committee to reconcile aggrieved party members across the country. His experience in politicking is expected to galvanise APC members across the nation to unite ahead of the 2019 general elections. HERBS CURED ME OF HERPES IN 7 DAYS. I’M சமத்துவ NICKI ,DR OSAJIE CURED ME OF HERPES VIRUS. I VISITED DIFFERENT HOSPITAL BUT DIDN’T GET A CURE. I SEARCHED THE INTERNET FOR CURE ON HERPES AND SAW TESTIMONY HOW DR MUSTAFA BUBA CURED SOMEONE. I WAS SCARED BECAUSE I NEVER BELIEVED IN THE INTERNET BUT I GAVE HIM A TRIAL BECAUSE I WAS HAVING NO HOPE OF BEEN CURED OF HERPES SO I CONTACTED HIM ON THIS EMAIL. DOCTOROSAJIE@gmail.com AND WHATSAPP HIM VIS +2348147912595..HE GAVE ME HOPE AND SENT HERBS TO ME THAT I TOOK AND IT SERIOUSLY WORKED FOR ME, AM A FREE PERSON NOW, MY HERPES RESULT CAME OUT NEGATIVE. I PRAY FOR YOU DR OSAJIE P COSMAS GOD WILL GIVE YOU EVERLASTING LIFE, YOU SHALL NOT DIE BEFORE YOUR TIME FOR BEING A SINCERE AND GREAT MAN. AM SO HAPPY, CONTACT HIM IF YOU HAVE ANY HEALTH CHALLENGES EMAIL..: doctorosajie@gmail.com ….or whatsapp +2348147912595.